A-HOTEL.com - Hotels in Kondiás. Current availability and special prices of Kondiás hotels. Kondiás hotels: On-line reservation of all price category hotels located in Kondiás centre or near centre. We provide special price offers for most of the hotels (discounts up to 60% off the regular hotel rack rate). After entering the dates of your stay you will see hotels with available rooms and their precise prices in a given dates. With filters you can narrow or refine the offer of available hotels and find for your stay the best hotel in Kondiás. Hotel Evgatis is a new hotel in Limnos, located on Evgati Beach, in distance of 6 kilometres from Myrina and the harbour. It features a pool with sun terrace and a children's section and offers free Wi-Fi throughout. Offering a sun terrace and views of the sea, ARMONIA 1 & 2 is situated in Myrina, on Evgati Beach, 5 km from The Castle of Myrina. Archaeological Museum of Lemnos is 5 km away. Enjoying an elevated position on the edge of Platis settlement, the family-run Hotel Dina offers self-catering accommodation. It is set within a lovely garden, while the beach is 500 metres away. Enjoy Greek hospitality and a wide of choice of activities in this resort ideal for families. A holiday here, is a real 'away from it all' experience, where you can relax, or keep as active as you like. Surrounded by well-tended gardens only 250 metres from Platy Beach, Fereniki Studios offers spacious, air-conditioned studios with free Wi-Fi. The village centre with taverns and shops is within a 5-minute walk. With a garden and a terrace, Iliovasilema is situated in Plati and provides free WiFi. All units come with a balcony, a kitchen with a fridge and a stovetop, and a private bathroom. Just 300 metres from the sandy Plati Beach, family-run Panorama Plati is built on a hillside, a 20-minute walk from Myrina Town and the port. It offers air-conditioned studios with free WiFi and views over the Aegean Sea. Set right on the beach of Platy, Platy Beach offers rooms with a private balcony and unlimited views of the Aegean Sea. It has a big, palm-tree garden and includes a restaurant, a bar and a children’s playground. Located right on the sandy Platy Beach of Limnos, Villa Victoria features a pool, a snack bar and a children’s playground amidst its well-tended garden. 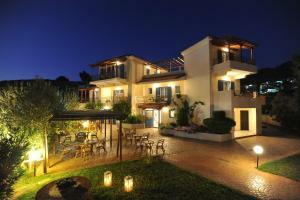 It offers self-catering units with a balcony overlooking the Aegean Sea, the garden or the pool. Close to Myrina's shops and in front of the imposing castle, the listed Archontiko Hotel is a charming, traditional guest house appointed with antique furnishings offering certified Greek breakfast. Archontiko Hotel offers a variety of well-furnished rooms in the heart of Myrina. Located 200 metres from the beach of Myrina, Sevdali Hotel offers air-conditioned rooms with balcony. Restaurants and shops are just 100 metres away. Traditional Stone House is located in Mirina, less than 1 km from The Castle of Myrina. 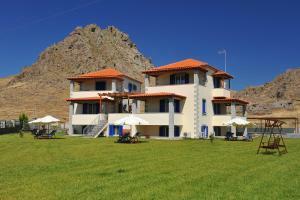 Popular points of interest around the property include Archaeological Museum of Lemnos and Port of Limnos. Set amidst a 10-acre estate and 2.5 km from the picturesque village of Moudros, Ethaleia Hotel overlooks the bay.